When renovating a bathroom, one of the most common questions about tile concerns the size that is appropriate. Some are of the opinion that size doesn’t matter, but it can matter because it makes a big difference in the look of the room. For smaller and bigger bathrooms, the size of the tile can affect the look. Here is a brief guide on what sizes to use for certain types of bathrooms. For smaller bathrooms, it is highly recommended to avoid larger tiles because they will dwarf the room itself and will be overbearing in design. Although some individuals prefer the large ones because it means a little less work, they can ruin the look of the bathroom. However, using 10 x 10-inch tiles can cause too many lines, especially if they have a heavy design on them. 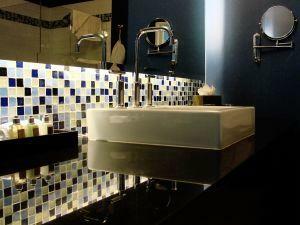 For the smaller bathrooms, it is recommended to use small to medium sized tiles, or even to use a mixture. Many combine 12 x 12-inch tiles with one-inch tiles to make fantastic designs on the floors and walls. Despite the amount of work involved, designs using only one-inch tiles are a growing trend because of the amount of variation that one can create. Since these tiles are mostly available in solid colors, they can create a great looking mosaic without drawing attention to the joining lines and without creating an overwhelming array of color. Many choose medium sized tiles for larger bathrooms partially because there is less work involved than the smaller tiles, but also because it gives a moderated look to the room. It will keep the large airy feel, but at the same time the size won’t be so overwhelming. Larger sized tiles look good on these bathroom floors and will not look out of place. In fact, designing a great look using larger tiles can be fairly simple. If the tiles are being placed on the stone wall, however, one must consider their weight. For this task, smaller or medium sized tiles work better.